We met Heather and Yaroslav at the Bliss Bridal show that took place at the Double Tree by Hilton Address: 16615 109 Ave NW, Edmonton, AB T5P 4K8 Phone:(780) 484-0821. Yaro is a pilot and they wanted to include planes somehow on their wedding day. 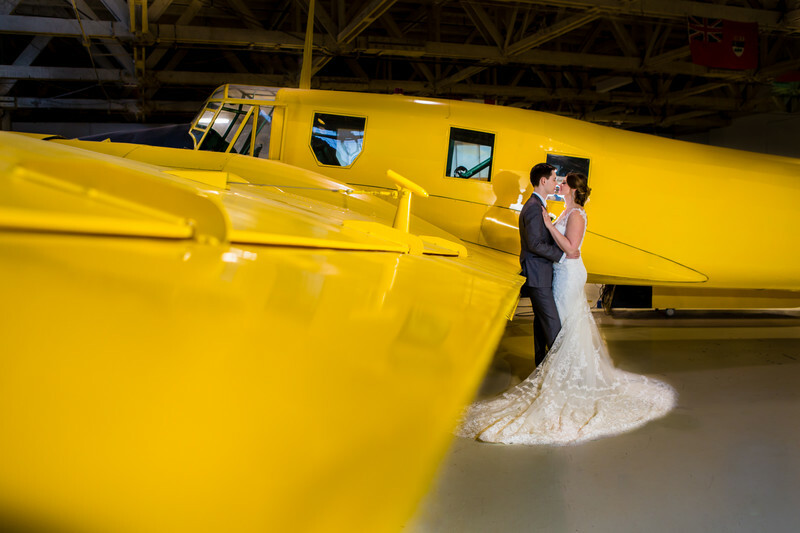 When we were planning their wedding portrait location both Heather and Yaro told us how much they wanted to use the Alberta Aviation Museum 11410 Kingsway Avenue Edmonton, AB, Canada T5G 0X4 Phone: (780) 451-1175 in Edmonton. It just so happens that all of the groomsmen were also pilots so this location could not have been any better. Yaro was the one who pointed out this yellow plane and we absolutely loved the contrast of the white wedding dress against the yellow plane. We posed them so they were both looking at each other to make this a more intimate portrait. The location was very dark so I needed to use off camera flash.I placed the light on a 45 from the couple so their shadow would reflect onto the plane. I used a Canon 430EX II with pocket wizard transmitter and receiver to trigger the flash. My camera and lens were a Canon 5D Mark III with a 24-70mm 2.8L series lens. I created this image because I wanted to have a nice wide angle shot that they could hang on their wall. The difficulties that I encountered would have been the lighting.